Le Creuset Flower Cocotte, 2.25 qt. Iconic French cookware with a spring-fresh design. The perfect size for a side dish or one-pot meal, this cast iron casserole delights with a bright, happy design. Its floral shape makes a sunny addition to your warm-weather table, and it offers all the benefits of cooking with enameled cast iron. The glazed interior protects against scratching, staining and odor absorption, and the heavy lid locks in moisture for delicious results. Available in three colors. LeCreuset quality is unmatched. This will be beautiful on the Easter table. I bought it as a gift for my daughter. She LOVES it!! Lavender is her fave color so this made it the perfect gift!! Love this piece! Bought one for my daughter and myself on her birthday! I absolutely love my new creuset! It's a real beauty!! The lavender color is beautiful and I enjoy cooking in it very much. I leave it on my stove even when I'm not cooking because it's so pretty and it adds style to my kitchen!!!! It is absolutely wonderful! I make a homemade mac and cheese and it fits perfectly. My new favorite Le Creuset. From the oven to the table. I love the shape and the color of the pot! My daughter in law is a good cook and loves Le Creuset. The minute I opened the email and saw this adorable pot, I ran for my credit card and ordered it for my DIL who had just had a birthday. She is happy, and I was happy with how much she likes it. I think I surprised her because this isn't the usual type of gift I think to send. Delivery was speedy - 3 days. She collects red Le Creuset cookware, and is as picky as most women, so I wasn't quite sure which color to order. But the yellow kept calling, and I went for it. She says it is perfect with her red. La Crueset is always my go to. My daughter loves this color! I own a Le Creuset piece and love it! Bought this for my daughter as a birthday gift. Cute and the color. I think my daughter in law will love it. Le Creuset quality and look of the cocotte. Because my daughter requested this item for her birthday. I have had my eye on this since it first came out. I am so excited to add it to my Le Creuset collection! Fun for Mother's Day, for someone who has every thing! chosen by the gift recipient. She loved the color and shape. The lavander color is so beautiful for springtime and Easter. I recently got some lavender Lenox plate sets. i think this color will go beautifully with them. Can't wait! Love the flower shape and pretty color! Love Le Creuset. I have several pieces. This is gift for my future daughter in law. Was waiting on this beautiful color to be available. Will look beautiful on my mom’s Easter table! Matches existing pieces in this color and it’s adorable! Always wanted one and love that it will be this adorable flower shape. I love the shape and color! I can't wait to bake mac & cheese in the cocotte! I LOVE purple and the flower shape is pretty. Love the new color !! I'm a girl and it's adorable. Love it! I am buying this for my daughter's birthday. 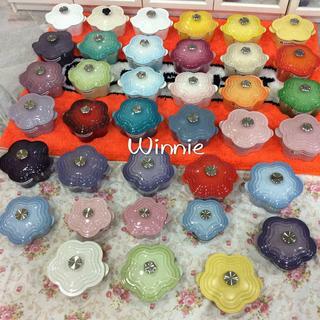 She collects Le Creuset and wants the new color. I think the Flower Cocotte is so attractive! Gift for my daughter whose favorite color is purple. The floral shape is lovely. 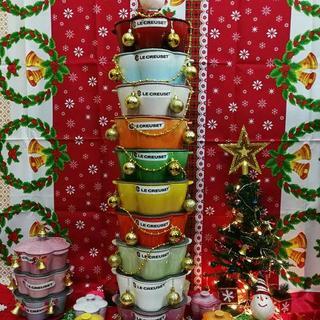 I love the specialty and festive Le creuset! So beautiful and decorative! Love the color & design! The price & the color. Is the color blue solid or darker (deep blue) at the bottom? BEST ANSWER: Both the base and the outer rim of the lid are slightly darker. Can this go on the stove? BEST ANSWER: Yes you can put it on the stove or in the oven. No microwave because it is cast iron. Yes definitely it can go on the stove but I was disappointed at how very small it is for the price. It only holds like 6 eggs if boiling eggs on the stove top. But it is adorable so I keep it on the stove for decoration, as well. Yes! I've used it on the stove several times. Yes. I use it all the time on the stove. Does it work on induction ? BEST ANSWER: Yes, all Le Creuset cookware works on induction. If you want, test for yourself with a magnet - if it sticks, it works on your cooktop. Yes, I have an induction stove and works just fine. I don't have an induction cook top, but did some research last year. I was told that any pan that is magnetic will work on induction. Just tested the Flower Cocotte,, and magnets do stick to it. Yes, it is compatible with induction. BEST ANSWER: The 2.25 qt. LeCreuset Flower Cocotte weighs 6 lbs 9.5 oz.